Matchroom Boxing will be promoting its first major card in Mexico when Brandon Rios fights Humberto Soto in Tijuana’s Municipal Auditorium Fausto Gutierrez Moreno on the 23’d of February. The fight will be aired live on the DAZN streaming service. With a record of 35-4-1, Rios, who has held the WBA World Lightweight title, and who has faced such huge names as Manny Pacquiao and Tim Bradley, is looking to get back into contender status. Soto, 68-9-2, who himself has held the WBC World Lightweight Title (as well as the WBC World Super Featherweight Title), is no doubt looking to reestablish himself, as well. “Man,” says Rios, “I’m excited to fight in Mexico, I haven’t fought there in ten years. 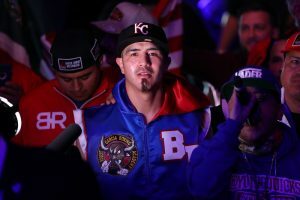 The Mexican fanbase has supported me since day one and everything I give in the ring is for my family and my fans, who have never let me down.” Rios makes it clear that he’ll be well prepared on the 23’d of February. “I’ve been staying busy in the gym,” he says, “so I’m ready to give the fans a great fight. The fights the fans love to see!” Veteran warrior Soto, on the other hand, is under no illusions that he must beat Rios if he hopes to have a successful career at this point. “I cannot wait,” Soto says, “for February 23’d. I am so excited for this great opportunity in a city that feels like my second home.” Still, the popular Mexican fighter states that: “I know that this fight is a ‘do or die,’ that is why I am very motivated and training really hard. We know that we have a tough opponent in Brandon Rios, a true warrior, but so am I. This will be a war and I will be ready to win!” Soto, who has fought ten times in the past five years, has won all but one of his bouts within that time frame.